Jazz up the Dorian scale by flattening its second note. This progression is designed to feature the Dorian flat scale, however, it’s possible to seek harmonic ‘sanctuary’ within the minor pentatonic scale as this is a five note framework that exists within Dorian flat 2. However, I think it’s more appropriate to think of it as Dorian with a major 7th, as it’s a scale that is frequently used in conjunction with Dorian over m7 chords. minor scale has seven modes (just like the major scale has seven modes). Over the next few lessons we’re going to be looking at each one of these modes individually as well as their various uses. This lesson, it’s the turn of the second mode, Dorian flat 2. Without getting too technical, if I were to take all the notes of C melodic minor and join them up to make different chords, it would be possible to compose an infinite number of different progres­sions. Each of these progressions would have a tonal centre. If you play the first progression, you’ll hear that the Cm chord is the tonal centre, whereas in the second progression the tonal centre is the Dm6 chord. In the past, I’ve highlighted the fact that the notes of any scale have a definite hierarchy depending on the accompanying chord progression – some will sound naturally at rest while others will act as ‘passing notes’. Over the first progression, the notes of a Cm triad (C, Eb and G) will sound at rest and the others will sound rather unsettled (D, F, A and B). In the second progression the exact opposite will be true: that is, the notes of Dm6 will sound settled (D, F, A and B), while the rest will sound restless (C, Eb and G). This means that, although we can use the notes of C melodic minor when we’re soloing over both progressions, we have to be prepared to interpret these same notes in a different way in each case. Consequently, when soloing over the second progression, we need to see the notes of C melodic minor as a D scale and not a C scale. This should then help you interpret the scale in the appropriate way (that is, navigate from position to position using Dm chords instead of Cm chords). It’s referred to as a mode of C melodic minor because it has exactly the same notes, only viewed from a different perspective. Below, I’ve listed some of the possible sounds that exist within D Dorian flat 2 that you should try. I suggest that you make some neck diagrams and plot out the shape of each device within all of the various scale shapes. This is vital if you are to get to grips with the scale. You should also try to superimpose some of the sounds from within C melodic minor that we studied previously. As you can see, the two examples will allow you to shift back and forth a tone between any ideas you may play using Dm and Cm or Dm6 pent and Cm6 pent. This time, I’ve given you five scale patterns for D Dorian flat 2, each containing a Dm chord form. I’ve also given you the same shapes again, but this time using D minor pentatonic scale as a framework. You may be wondering why some scale-fingerings have got four notes which are played on one string and only two on another. As usual, these patterns are meant to act as visual aids – once you have learned them, you can do what you like. 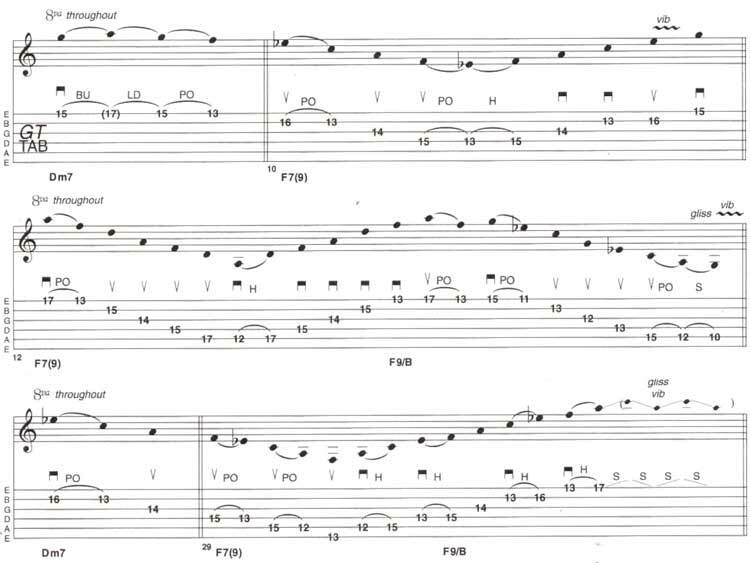 Next lesson is the fifth mode of melodic minor, Mixolydian flat 6. It’s a full lesson of Dorian Flat 2 Scale.